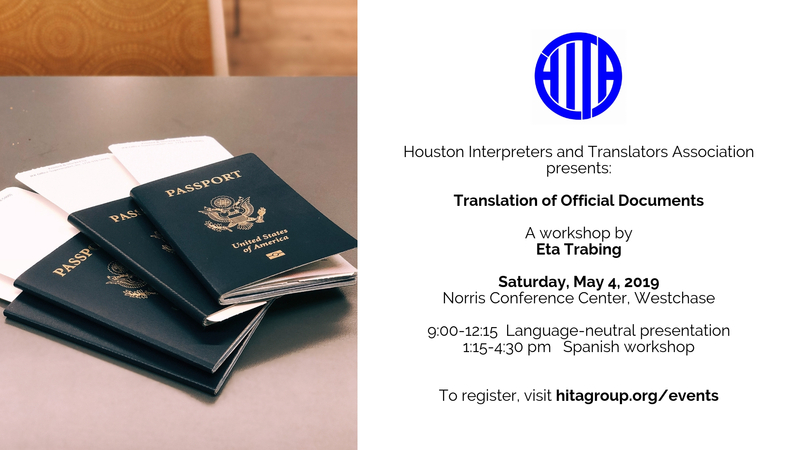 This workshop will help you understand the process of translating official documents, what questions to ask your clients (and yourself), and how to deliver the translation. The morning session will cover the process of translation, apostilles and notarization, types of official documents and their examples, analysis of original text, questions to ask before starting the job, research, untranslatability and what to do about it, client requests, proofing and editing, and client education. This session will be offered in English and will be language-neutral. The afternoon session will consist of the hands-on practice translating official documents from Spanish into English and from English into Spanish. Participants will get feedback from the instructor and a chance to discuss the translation challenges in a group setting. You can sign up for either or both of the sessions. and JBCC (3 for each session or 6 in total, non-ethics credit hours). PM session 1:15 pm – 4:30 – Spanish into English and English into Spanish practice. Eta Trabing has been a freelance English-Spanish-Portuguese translator since 1957, starting in Buenos Aires, Argentina. She received her Cambridge University Overseas Certificate there at Northlands School. She retired from interpreting in the federal, state and county courts principally in Texas and North and South Carolina in 2002; she is a federal (since 1980) and state (since 1995) certified court interpreter in Spanish. She was on the Boards of CATI (NC) and HITA, has covered almost all other Board positions and has just bowed out of the Presidency again. Over the decades, she has given many presentations as a guest speaker for ATA and other associations in the U.S. and abroad. She now lives in Houston, Texas, again, after a lovely three years in Ocala, Florida. In the last 30 years, Eta also was a conference interpreter and has traveled extensively throughout the Americas, in Europe and Australia. She has published 25 books on translation and interpretation, bilingual glossaries and dictionaries, through her company Berkana Language LLC. She is an approved provider for continuing education credits for both the Office of Court Administration (JBCC – OCA) in Texas, the American Translators Association (ATA), and has been approved on a class by class basis by NAJIT for credits in the past.